Lynden-based Woods Coffee contributes to numerous charities and schools and is dedicated to serving others. SERVING THE COMMUNITY: Wes and Diane Herman, center, run Woods Coffee with their children, Taylor Herman, far left, Connor Herman, gray jacket, and Kelly Spiker, second from right. Photo by Hayley Young. This article appears in print in the December 2017 issue. Click here for a free subscription. 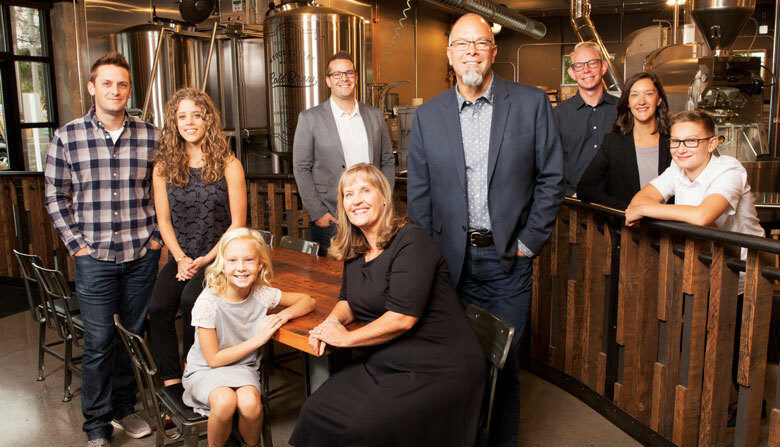 Wes and Diane Herman gave a challenge 15 years ago to their four home-schooled teenagers: Create a business plan that eventually supplied the grounds for Woods Coffee. “We wanted to teach them how to start a business,” says CEO Wes Herman. Three of the adult children work in the company, while the fourth is “our insurance agent,” Herman says. In 2002, Woods opened the first shop in Lynden, and after six months, a second store there. Now the company has 19 locations: 14 in Whatcom County, two in Skagit, two in King and one in British Columbia. Herman says family operators keep best practices in mind, from quality control of ingredients to belief in its more than 250 employees through supportive benefits. The company has a 401(k) plan, health care coverage at 30-plus hours and advancement opportunities. The company contributes to numerous charities and schools, including Western Washington University. For each bag of WWU Viking Blend sold, $1 goes to scholarships. Community giving centers on groups that fight human trafficking, support foster children, and help at-risk and low-income students. See the full list of 2017 Family Business Awards winners here.